This blog is called "3rd Tour" because we are on our third assignment with EMC. The people above are from Chihuahua, where we did our '2nd Tour'. We often refer to our 2 tour as being kind of utopian. The reason for this is because it was a wonderful time for us as a family. We left Chihuahua in 2000, so, if you do the math, the above people were not church leaders back then! 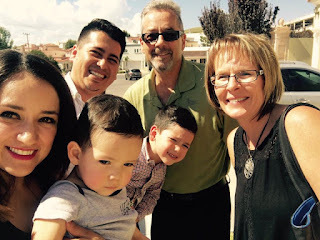 It was such a blessing to share breakfast with some of the people from our days in Chihuahua, and then head to church, where we got some surprises. First we enjoyed a rich time of praise and worship, led by Victor and Claudia. Great to hear God's people worship in song (Something we often miss here in GDL). Then, Juan Carlos and Claudia were in Chihuahua and he preached the morning message. What an wonderful morning with some wonderful people. God is good. The best part of the whole thing is watching national leaders doing the work God has called them to. To see them doing it so well. I was blessed by their ministry that Sunday morning. The wonderful singing, with gifted musicians, great voices, and the ability to lead their people in worship. To hear the Word of God preached so well. To see their love for God and their desire to grow and see the work grow. I remember Claudia as a young girl, and to see her now, a wonderful young woman, wife, mother, leader in the church, and a business women as well, warms my heart. We may not have led these young people to the Lord, or even had them under our leadership, but to have been a part of this work, is a blessing beyond compare. We did work together with Claudia's sister, Rebecca, and her brother-in-law, Aldo, both of whom God has called home. We mentored them and they mentored Victor and Claudia. Reproducing fruit. Oh that God would have found me faithful in the past, find me faithful in the present, and also in the future. One never knows who's life they are impacting or who's life that person's life will later impact. Like it says in I Corinthians 3:6-7, some water, some plant, but it is God who makes things grow. We were also able to meet up with Walter Renpening, who is the pastor of the church in Cuathemoc. We had a wonderful time over lunch, reconnecting and hearing about what God is doing in their church and their lives. It was such a blessing to see Walter and his new wife Susie's enthusiasm for the ministry in Cuathemoc. Walter was a wonderful friend who worked alongside Alvira Friesen and then tragically lost his wife. God is using him in his work there and you can see the joy in his eyes. We did work with him over the years (while living in Chihuahua) but I often wondered who was on the receiving end. We were always blessed working with him and the Cuahtemoc church and I trust we blessed him and his family. Those were good years of mutual encouragement as we sought to be faithful to God's calling on our lives. We also made a surprise visit to the school in Blumenau, where we were able to connect with several friends from years gone by. This was such a blessed time for me. Below are pictures of people from what feels like another life. Way back when, Mike was maybe 2 years old, so 23 years ago, we were invited to go to Chihuahua to youth camp. Ernie was to speak at their annual youth conference. The Bojorges sisters were my first friends in Chihuahua. To see these ladies, (pictured are 2 of the 4) still loving Jesus, working and serving Him, leaves me in awe of God's faithfulness. The hugs were many, long, and tight! God has been faithful, both in my own personal life, and in the life of many friends. He has been faithful to His church and His people. We were so richly blessed to see some of the fruit of our labours. Seeds planted, seeds watered and the reproducing of a marvellous harvest. God is so Good. Welcome to our Blog, 3rd Tour. We are Ernie and Diane Koop, missionaries on our ‘3rd Tour of Duty’ so to speak. Here is where you can find out about us and our ministry.